In this deal you will get all 16 boxed figures plus the display box, which holds up to 12 figures. Do you miss the days of Mego? Can you remember the first time you took a Mego figure out of the box? Or are you a newer collector, who has only heard about the glory days of the beloved toy company? Well, there's good news for collectors of all ages, because Figures Toy Company is going to give you the opportunity to enjoy more "Mego moments" with original Mego style line re-issues, packaged in classic style window boxes (same size as the originals)! This series will include 16 DC Comics characters as they were seen in the original Mego line, right down to the last detail even as they were packed in the boxes back in the 1970's! Not only are these figures done in the Mego style design, both in figure style and packaging, but an added touch is that you'll be able to show them off in your very own Mego style store display! Figures Toy Company is producing the display to recapture as much of that Mego magic as possible! Imagine showing off your collection the way they were seen in stores all those years ago! Great Addition to any Mego collection. Check out our other auctions for more 8 inch figure items as well as other collectibles. 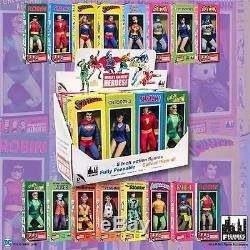 The item "DC Comics Mego Style Boxed 8 Inch Action Figures Set of all 16 Figures And Box" is in sale since Friday, February 3, 2017. This item is in the category "Toys & Hobbies\Action Figures\Comic Book Heroes". The seller is "classictvtoys" and is located in Tampa, Florida. This item can be shipped to United States, Canada, United Kingdom, Denmark, Romania, Slovakia, Bulgaria, Czech republic, Finland, Hungary, Latvia, Lithuania, Malta, Estonia, Australia, Greece, Portugal, Cyprus, Slovenia, Japan, China, Sweden, South Korea, Indonesia, Taiwan, South africa, Thailand, Belgium, France, Hong Kong, Ireland, Netherlands, Poland, Spain, Italy, Germany, Austria, Israel, Mexico, New Zealand, Philippines, Singapore, Switzerland, Norway, Saudi arabia, Ukraine, United arab emirates, Qatar, Kuwait, Bahrain, Croatia, Malaysia, Brazil, Chile, Colombia, Costa rica, Panama, Trinidad and tobago, Guatemala, Honduras, Jamaica, Antigua and barbuda, Aruba, Belize, Dominica, Grenada, Saint kitts and nevis, Saint lucia, Montserrat, Turks and caicos islands, Barbados, Bangladesh, Bermuda, Brunei darussalam, Bolivia, Ecuador, Egypt, French guiana, Guernsey, Gibraltar, Guadeloupe, Iceland, Jersey, Jordan, Cambodia, Cayman islands, Liechtenstein, Sri lanka, Luxembourg, Monaco, Macao, Martinique, Maldives, Nicaragua, Oman, Peru, Pakistan, Paraguay, Reunion, Bahamas, Viet nam.